In the just concluded Wimbledon Tennis Tournament IBM showcased some cool technology. IBM SlamTracker™ - a real time statistics and data visualization platform that leverages IBM's predictive analytics technology. It provides an ‘at a glance’ visual representation of a match using scores and statistics and encourages fans to get more involved by interacting with the data to gain deeper insight into the game. IBM SlamTracker™ analyses over eight years of Grand Slam data (over 41 million data points), to identify patterns in players and their styles. 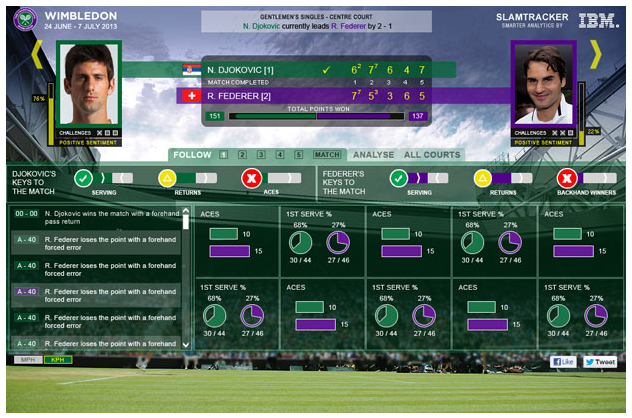 Before each match, IBM analyses historical matches between the players (or between players of similar styles if the players in question have not met before). In the last couple of years IBM did trial runs of SecondSight, which for the first time enabled the viewer to track the direction, speed and distance of players as they moved about the court. Data from SecondSight enables displays such as one below. Hopefully looking at old boring 2-row table of games won by each player in a match will be gone for good.